RapidShare is probably one of world's best-known HTTP file sharing websites. Years ago many of the popular file lockers sites turned a blind eye to piracy, which was one of the driving factors of their huge popularity. Legal pressure eventually prompted RapidShare to comply with copyright holders, the site rebranded itself as a personal cloud storage service and adopted a very strict file sharing policy. The site got rid of its image as a piracy website but as a result RapidShare lost the majority of its users. 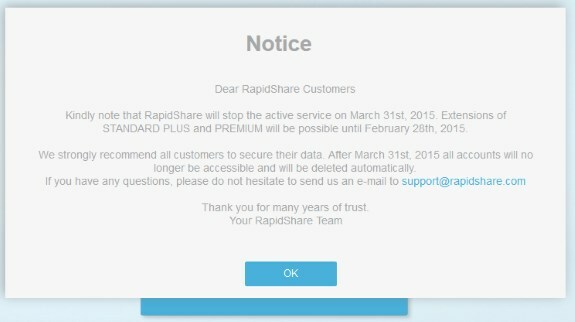 RapidShare's cloud storage service is now coming to an end as the company announced it's closing down on March 31st, 2015. All RapidShare customers are recommended to backup their data as after March 31st, 2015 all accounts will no longer be accessible and will be deleted automatically. An exact reason for the closure isn't provided but people are speculating the company may no longer have been sustainable due to its dwindling userbase.